First of all, congratulations to Monica (@Disney_Bride), the winner of the “I run for Dole Whips”/ “I run for Mickey Bars” t-shirt giveaway! Monica’s response to her favorite snack was “Mickey Bars! Followed by Dole Whip, then a tie between Mickey Pretzel and Mickey Rice Krispie treats (these were our wedding favors)”. I wonder if she’ll chose the Dole Whip or Mickey Bar shirt?!? Now, my weekly training recap – a bit late, but I was busy enjoying Disney! Friday – walking around Disney! Saturday – walking around Disney! Sunday – 3 mile run and walking around Disney! 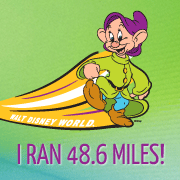 Weekly Mileage – 9 miles run / A LOT of walking around Disney! Overall – Not thrilled with the amount of running this week but I guess a light rest week is fine since it’s sandwiched between two weeks with 20 mile runs, plus we did so much walking around the parks down at Disney my legs were exhausted! Tons of yoga at the beginning of this week with our practicals, I still can’t believe my yoga teacher training is done, just the written test and some assisting left to finish! Planning on back to back long runs again this weekend (10 and 20 miles) before my taper begins for Goofy! I hope it goes as well as my last long run! A separate post on our Disney Holiday trip will be coming shorty, but for now I’m off to study for my yoga teacher certification test! oh man you really remind me that i need to get in some more yoga! !